How Long Can Snowbirds Spend in Non-U.S. Destinations? How Long Can Canadian Snowbirds Visit Non-U.S. Countries? A growing number of snowbirds are seeking adventure and exotic experiences beyond the U.S. in retirement. This can mean spending the winter in Central or South America, parts of southern Europe or even Asia. If you’re thinking about spending your winter in a country other than the U.S., remember that each country has its own rules about how long you can stay, whether a visa is needed and other ad hoc rules for long term visitors. These rules differ from those covering how long Canadians can stay in the U.S.
Before you plan to visit any of these places, make sure you know the rules. It’s also important to remember that each Canadian province has its own rules about how long you can be away in any given year without losing your provincial health care coverage - make sure you check how long your province allows you to be away to avoid risking losing your healthcare coverage in Canada. Prior to planning your winter trip somewhere exotic, it’s always wise to check the official Canadian government website for travel advisories and requirements for the country or countries you are planning to visit. The website has lots of useful information and keeps Canadians informed about crime, political unrest, severe weather damage, illness and disease, conflicts, etc. The website also contains recommendations for any vaccinations you may need. However, you should always check with your own doctor well in advance of your travel date to find out what vaccinations, if any, are recommended for your destination. How long can Canadian snowbirds stay in these countries? We’ve created a list of popular places that Canadians consider for their winter sojourn. For your convenience, we’ve included links to both the Canadian government travel site and the destination’s Canadian embassy or official tourism website. This information can change frequently, so we strongly recommend that in addition to the information we have provided, you check the official government websites before booking your trip or making plans to ensure you are receiving the most up to date and accurate information. If your destination isn’t on our list, check with the Canadian government travel site as well as that country’s consulate, embassy or government website for any rules that might apply to your stay. Be advised that the information below assumes you are a Canadian citizen. If you are a Permanent Resident but hold a passport from another country, please check with the official government site for further information that relates to your citizenship. How long can I stay? Canadians can stay in Mexico for up to 180 days per year. How long does my passport have to be valid for after I plan to return? Your passport must be valid for your entire stay in Mexico. Do I need a visa? You do not need a visa, but you will receive an official tourist card called a Forma Migratoria Multiple or FMM. Make sure you hold onto this card, as you will need to present it to customs officials when leaving Mexico. Where can I check for information? How long can I stay? Canadians can obtain a visitors’ visa for 3 months (for everyone else it is one month). Once there, you can apply to have it extended for up to another 3 months at the Cuban government’s discretion. How long does my passport have to be valid for after I plan to return? At least one month after your departure date from Cuba is recommended. Any other rules I should know about? You must have a return or onward airline ticket, proof of valid health insurance (not from a U.S. insurance company), and proof of sufficient funds for the duration of your stay. How long can I stay? Canadian visitors can stay up to 90 days without a visa, but the length of your stay can is determined at the discretion of the immigration officials when you enter the country. How long does my passport have to be valid for after I plan to return? At least one month after your expected departure date from Costa Rica. Any other rules I should know about? You must have a valid return or onward ticket. How long can I stay? Canadian tourists can stay for 180 days. No visa is required. If they want to stay longer, they must depart Panama for at least three days and may then be able to return for another 180 days - however you must also change your residency status. How long does my passport have to be valid for after I plan to return? Your passport must be valid for at least 3 months after your arrival date. If you plan to stay longer than 90 days, then it must be valid for at least 6 months after your arrival date. Any other rules I should know about? You must have an onward airline ticket and at least $500 USD and a valid credit card. You must obtain a valid entry date stamp on arrival or you can be subject to a fine. How long can I stay? Canadians can stay for 30 days without a visa. If you want to stay longer, you must go to the Immigration Department in Belize City or to Senior Immigration officers in other areas of Belize for a visa extension. How long does my passport have to be valid for after I plan to return? Your passport must be valid for 6 months after your departure from Belize. Any other rules I should know about? You must have an onward airline ticket and proof of sufficient funds for your stay (USD 60 per day) – half should be in cash and the balance by credit card. If you plan on spending the winter in multiple E.U. countries, it’s important to be aware that most countries in Europe are members of the Schengen Agreement, which abolished internal borders for the 26 participating E.U. countries, effectively allowing free unrestricted movement of people among these countries. Visitor rules for tourists were also harmonized for these countries. However, not every E.U. is part of this agreement, so do your research if you plan to travel around Europe. How long can I stay? Canadians may stay up to 90 days of any 180 day period without a visa in any Schengen member country, which includes Portugal. If you want to stay longer you must apply to the embassy of that country for a visa. How long does my passport have to be valid for after I plan to return? Your passport must be valid for at least 3 months after your intended departure date from the Schengen zone. How long can I stay? Canadians may stay up to 90 days of any 180 day period without a visa in any Schengen member country, which includes Spain. If you want to stay longer you must apply to the Embassy of that country for a visa. How long can I stay? Canadians may stay up to 90 days of any 180 day period without a visa in any Schengen member country, which includes France. If you want to stay longer you must apply to the Embassy of that country for a visa. Any other rules I should know about? The French government has reintroduced internal border controls at certain border crossings. Canadians may be required to pass through immigration controls when entering France, even if arriving from another Schengen area country. How long can I stay? Canadian passport holders do not need a visa for visiting Thailand up to 30 days for tourism purposes. However, if you intend to stay more than 30 days, you need to apply for a tourist visa beforehand. If you are entering Thailand overland from neighboring countries as a tourist you may stay up to 15 days. How long does my passport have to be valid for after I plan to return? 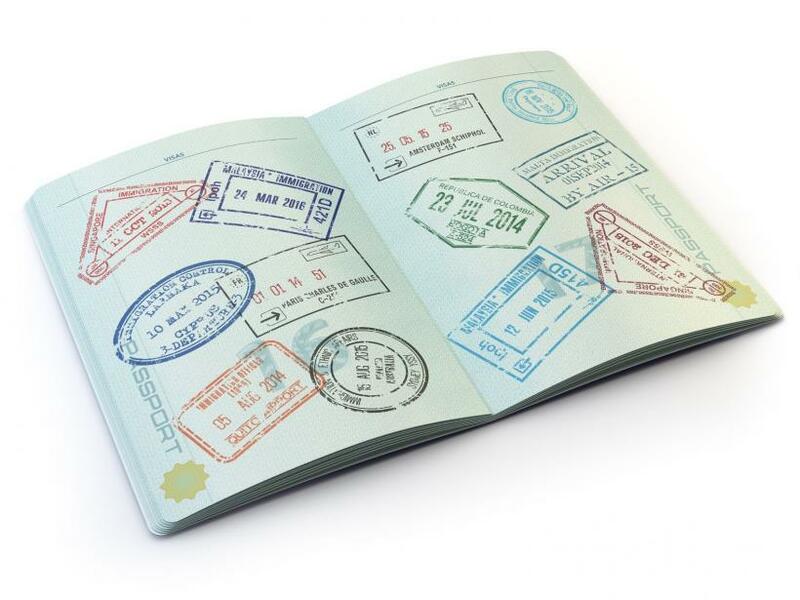 Your passport must be valid for at least 6 months after your departure date. Check with your airline to see if they have any additional requirements regarding the period of time your passport must be valid for. Any other rules I should know about? You must have a valid airline ticket for departure out of Thailand within 30 days. You must obtain an official entry stamp from an immigration office upon entry. Visitor Visa, which allows you to stay for up to 3, 6 or 12 months at a time, depending in which version you apply for. How long does my passport have to be valid for after I plan to return? Your passport should be valid until after your planned return to Canada.